Note: Michigan athletics' chief marketing officer Hunter Lochmann resigned from his post today after 4 years on the job. I am not going to do entire post about it, but I did want to mention it on here. I didn't know Hunter, I never met him. His public image was not the greatest due to many things, but none more than simply being hired by, thus, forever tied to Dave Brandon. His public comment a week ago about former players and "fleeting relationships" was obviously his undoing and very unfortunate for him. Harbaugh-to-Michigan articles/rumors/tweets via local media and insiders who cover Michigan Football have been circulating for weeks…with confidence percentages growing by the day. National media, especially those to cover the NFL exclusively, have balked at the notion that Harbaugh would return to college and turn down multiple offers from any NFL organization with an opening at the end of the season. But as the days pass and Michigan doesn't appear to be any closer to filling it's coaching vacancy, the stronger Michigan's case for Jim Harbaugh becomes – and clearer that Michigan either knows something we don't, or this is just #Hackett'sHarbaughHailMary. Either way, the national media is starting to take notice. And even though the 2nd half of every article refutes why Harbaugh should actually go to Michigan, I'd say national mindsets are shifting. Grantland has a piece entitled simply enough: "Dear Jim Harbaugh: Just Go to Michigan". You can imagine where it goes from there. He’s obsessed with his own corny maxims, he wears the same pair of pants every day while drinking the same whole milk, and he gets a kick out of surprising players with birthday cakes and trivia. He’s brilliant, but he’s also sort of a dork. This is a college coach. The same habits that have become grating in an organization full of professional egos would make him great with a locker room full of 20-year-olds. There would be no front office to clash with, no millionaire players tuning him out. Rosters turn over every year in college, and by the time Harbaugh’s grinding tactics might burn some players out, those players would have graduated or moved on, and there’d be a whole new crop ready to be impressed by Hemingway quotes and League of Shadows pep talks. It’s not to say Harbaugh can’t succeed elsewhere in the NFL. He’s a good enough coach to thrive anywhere. But if we’re weighing the potential of each destination, Michigan makes a lot more sense than the Jets, Raiders, Bears, or even the Dolphins. Success in college is just as hard to attain, but much easier to sustain. While this is probably my favorite snippet, the entire piece is truly worth a look. It's very well done. CBS Sports' Tom Fornelli wants to know if Michigan can finally land Harbaugh. I don't know if Harbaugh turns the job down this time, but until Harbaugh is actually in Ann Arbor for a press conference, I'm taking a wait-and-see approach to it all. As I've said, it's all going to come down to whether Harbaugh wants to remain in the NFL. If he does, then it's just not going to happen as he will have numerous job opportunities available to him there this offseason. And I think he wants to stay in the NFL, so I don't think Harbaugh will be the next coach at Michigan. I will say that I hope I'm wrong, though, because I think Harbaugh is exactly what Michigan needs right now. 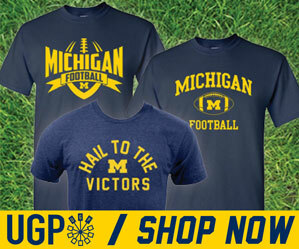 College football and the Big Ten is better off when Michigan is a power. USA Today's The Big Lead said yesterday that the Harbaugh-to-Michigan smoke is becoming more palpable. Michigan’s coaching search has been more or less inert. Then, yesterday, it wasn’t. San Francisco was eliminated from the NFL playoffs. Jim Harbaugh became much more available. Some search wheels appear to be turning. Fox Sports is also running a piece which uses words like "smoldering", "targeting" and "fueling". Actually, try writing any coaching search piece without using those words. The school hasn’t indicated one way or another that it’s targeting Harbaugh, but if the tempo of this process is itself any indication, Michigan is allowing every opportunity for the San Francisco 49ers coach to entertain coming back to Michigan to resurrect the program at which he played his college ball. Like most pieces covering this thing, writers are careful to word things so as to fuel the speculation but not be tied to it at the same time. We're all guilty I suppose. /I'll have what he's having. As of late Monday night, when the internet broke loose all sorts of oddly specific rumors concerning Harbaugh's possible Michigan offer and potential assistant coaches, Michigan fans have been giddy that an announcement would be forthcoming. As we sit here on Wednesday afternoon, no such indicators are present. As we said yesterday, this is a situation which could change on a dime in terms of Harbaugh and what he wants. Odds are he's waiting until the end of the season to weigh all his options. NFL rules prohibit contact from one NFL team to another team's coach during the season. But as soon as the regular season ends, expect JH to be flooded with dollar signs and offers he can't refuse. It appears thats when Jim's "swim lane" ends. All that said, I think it's clear that Jim Hackett has done a masterful job coordinating this thing. Two previous athletic directors had a shot at Harbaugh and didn't even come close. And even if Hackett doesn't deliver JH back to Ann Arbor, it's clear that he's left no stone unturned.